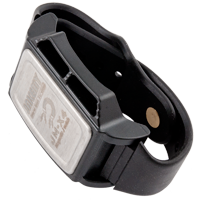 JAKEMY JM-X4 Magnetic Component Adsorption Wristband looks lie a watch but it's got special magnetic surface for "catching" screws, washers and any small metal parts. JAKEMY JM-X4 also has two magnetic pockets for smaller parts. Especially recommended for service of any electronic equipment in the watchmaking industry and small electronics (phones, tablets). The watch has a nylon strap with quick Velcro closure. 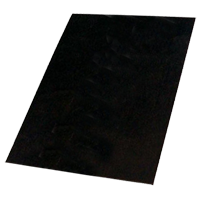 Magnetic mat for screws used to servicing, holding screws, size A4 21x30cm. 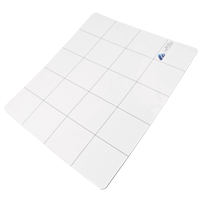 Magnetic mat for screws used to servicing, holding screws, size A4 25x30cm. 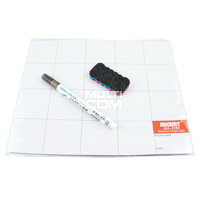 Magnetic Mat JAKEMY JM-Z09 is a magnetic mat that prevents accidental loss of small parts while opening electronic equipment. Includes pen and sponge. 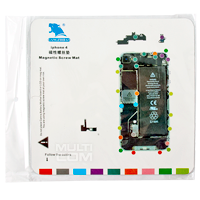 Magnetic Screw Mat for iPhone 4/4G 20x19cm designed for technicians and electronics prevents accidental loss of small parts while desoldering iPhone 4/4G. Mat by identifying the order loosening the screws prevents damage to your device during disassembly and re-assembly (phone got diffrent screws so if you accidentaly put it to wrong hole you can demage PCB). 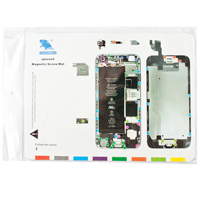 Magnetic Screw Mat for iPhone 4S 20x20cm designed for technicians and electronics prevents accidental loss of small parts while desoldering iPhone 4S. Mat by identifying the order loosening the screws prevents damage to your device during disassembly and re-assembly (phone got diffrent screws so if you accidentaly put it to wrong hole you can demage PCB). 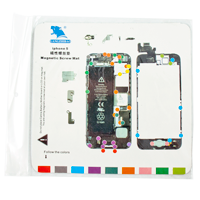 Magnetic Screw Mat for iPhone 5/5G 20x19cm designed for technicians and electronics prevents accidental loss of small parts while desoldering iPhone 5/5G. Mat by identifying the order loosening the screws prevents damage to your device during disassembly and re-assembly (phone got diffrent screws so if you accidentaly put it to wrong hole you can demage PCB). 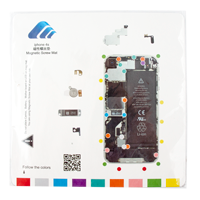 Magnetic Screw Mat for iPhone 5S 20x20cm designed for technicians and electronics prevents accidental loss of small parts while desoldering iPhone 5S. Mat by identifying the order loosening the screws prevents damage to your device during disassembly and re-assembly (phone got diffrent screws so if you accidentaly put it to wrong hole you can demage PCB). 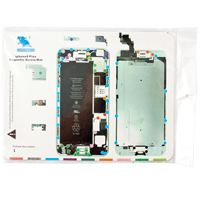 Magnetic Screw Mat for iPhone 6 25x19cm designed for technicians and electronics prevents accidental loss of small parts while desoldering iPhone 6. Mat by identifying the order loosening the screws prevents damage to your device during disassembly and re-assembly (phone got diffrent screws so if you accidentaly put it to wrong hole you can demage PCB). 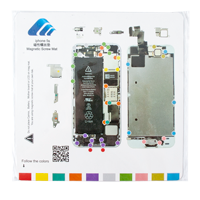 Magnetic Screw Mat for iPhone 6 Plus 25x19cm designed for technicians and electronics prevents accidental loss of small parts while desoldering iPhone 6 Plus. Mat by identifying the order loosening the screws prevents damage to your device during disassembly and re-assembly (phone got diffrent screws so if you accidentaly put it to wrong hole you can demage PCB).